Info on people, places, and things helpful in my genealogy research. I believe this is Margaret from the picture shown below. This picture is most likely that of the Thomas H. Leonard family. The notes shown on the pic were made by me with info from their census entries. Click on the picture for a larger version. I am trying to locate a descendant of Mary Leonard Bassett who posted to the Rootsweb message boards in 1999 but have yet to get a current email addy on her. (her name is Tammy Meyer of the Dearborn Heights MI area. Days like yesterday(Monday) make me realize how lucky I am. Not that anything bad happened..far from that. I awoke at 5a.m. Monday morning and started through my usual routine. Make coffee, check email, do a little genealogy before it's time to get my daughter up and ready for school. Jim and I will be married two years in mid Feb. I've been researching his family history for about a year now. While we have lots of pictures of the older generations we don't have an inkling who most of the older ones are. I'd been thinking about that and feeling like the only way I could find out who those people were was to get back a generation or two on his Sutherland & Irving lines. These are the lines of his great grandparents: James Sutherland and Anna Gertrude Irving. We have pictures of Anna in her wedding dress and several others taken around the same time which have photographers markings or identification from Ontario Canada. Most of them are from the Woodstock area so I had a fairly good idea of where the family was from but given the popularity of the surname and nothing to go on to help identify that I had the correct family it seemed a bit hopeless. I typed the search terms Sutherland, Irving, Woodstock and Oxford into Google Search. census entry that they were married in 1903. So not only did I get the exact date, but also the names of James parents and Annie's as well. From there I've found census entries for both families and will be working my way back. I posted a few queries yesterday to another researcher who seems to be looking at the same lines earlier on but since their post is from abt. 10 yrs ago I don't hold much hope in hearing anything back from them. 014784-03 ( Oxford Co) James SUTHERLAND , 26 , machinist , Woodstock , Hamilton , s/o William SUTHERLAND & Elspeth MILNE , married Annie G. IRVING , 24 , Drumbo , Woodstock ,d/o Pierce IRVING & Anna KEELER , witn: W.J. SUTHERLAND of Woodstock & Margaret McKAY of Hamilton , 30 Mar 1903 at Woodstock. Time is flying....but my research seems to be standing still. I have been so busy with the holidays, school projects(mine & Brittany's) and with finals coming up haven't had much time at all for Genealogy. I'm hoping that during the time between semesters I can write up some reports on some of my brickwalls so that I have a mission plan. Writing a synopsis of what I have and where I'm at in research on a specific line has helped me several times to think through things and come up with new ideas on where to search. Two things that have helped me most are researching a direct ancestors siblings and looking at the neighbors from their census entries. Hopefully I will be kicking some idea around over the holidays. People in the Pictures Continued. The discoveries from the photos sent to me by the Clawson Historical Museum's curator have really got me trying to come to conclusions as to which families are in the pictures which we have from my husband's family which are unidentified. The majority of the pictures don't have photographer's studio marks and those that do were Canadian which is where virtually all of Hubby's lines were prior to settling in Michigan. One photograph of a large family had a marking that said "Wheel City Studio Cheboygan, Michigan" so I looked at my FTM file for Jim's lines that were in that area. 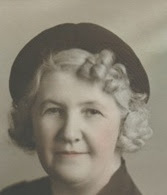 There were two families there in the 1900s--Ellen Lincoln Buchanan Stoner(she was widow of John Buchanan and mother of 3 sons) she had remarried and by 1910 is in Pierce Co. WA. The other family that was in that area was that of the elusive Thomas H. Leonard. Going by Census & Death records I've been able to place him in the area around 1901-1910. He and his wife Jane McHugh had a rather large family with 7 children--3 sons & 4 daughters. The picture with the Wheel City Studio shows what looks to be parents with their seven children. I got out the census entry for this family to compare the children listed with the ones in the picture. I grouped the children in the picture from oldest to youngest and the pattern of son, daughter, daughter, daughter, son, daughter, son fits perfectly with the known children of Thomas & Jane. I immediately looked at the daughter who would if my guess was correct be Margaret Leonard (my husband's great grandmother). A comparison of the face with a known picture of an older Margaret Leonard really makes me believe even more that this is the Leonard family. I'd been working with another Leonard researcher who believes that her lines may connect with that of my husbands so I sent her a quick explanation and copy of the pic via email. She thinks she may have a similiar picture but we will have to wait until she can get to her box of family pictures. Last week I wrote an email to the Clawson(MI) Historical Museum inquiring about Alice Shallow Buchanan. Alice was the wife of William Buchanan(b. 1873) and was listed as a widow in the 1930 census(see below) living in Clawson MI. I wanted to know if Alice worked in Clawson at the town hall as a Stenographer or did she merely work IN Clawson. A picture of the buses from B&B bus line of the buses. 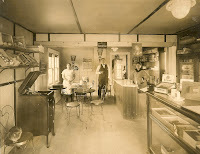 Two pictures of Burke's confectionery when it was known as Buchanan's Confectionery and owned by Frank & Family taken in 1921. A picture of Main street and the Burke's confectionery taken in 1924. 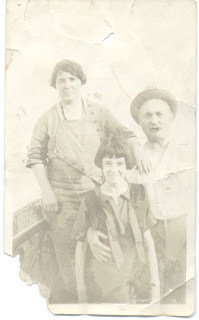 The picture of Frank & Julia helped me to identify them in some old family photos that weren't labeled. I'm so glad that I wrote and inquired about this history. Things like these bring the people in the pictures to life. I'd sent off for the death record from the Cheboygan Co. MI library of a John Leonard in hopes that this would be THE John Leonard who was an Uncle of Thomas H. Leonard(Jim's Direct line) & living in Thomas H.'s household in the 1900 census. You can read my earlier post here. I don't want to go down the wrong road in this research but the age and location is certainly right on the money for it to be his Uncle. From the Death Info I learned that this John Leonard was a widowed farmer and was the son of Hugh Leonard & Dorothy Downey. This doesn't tell me for certain that this John Leonard is the one I'm looking for as I don't know for certain who Thomas H. Leonards parents were. It is progress though in that I can see if there is a trail from the Hugh Leonard & Dorothy Downey that might lead to Thomas H. Leonard's Dad. I consider myself lucky to have had two grandparents who lived to be over 100 years old. My maternal grandfather died a few days shy of what would have been his 102nd birthday. My paternal grandmother lived a few months beyond her 102nd birthday. My parents married later than average and were both the next to the youngest child in their family. This meant that by the time I was born, my grandparents were in their early 80s. I did start my research in 1990 at the age of 22 which at that time was a bit of an early age for interest in genealogy. However, by that time my grandparents were not in the best health and state of mind for remembering. I woke up this morning realizing that I did not remember that much about my grandparents heritage that had been passed down from them and not just from what I had learned about their families through my own research. It's too late to ask what they remembered from their childhood. My paternal grandmother's parents(The Jakes) raised horses in Bedford Co. TN. These great grandparents descended from JAKES, HARGER, MORROW, FRIZZELL, & MANLEY families. I don't remember much about my early childhood but I do remember parts of a song that my grandmother used to sing when she bounced one of my brothers on her knee. I think it might be an Irish tune though I'm not sure whether its a lullaby or a drinking song. I tried Googling the words I remembered but most of the hits didn't call up anything that looked remotely similar. The words I remember, and I don't think that she was singing all of the lyrics, were "Dee Dee Diddle To rah riddle....long summer day". I had written in an earlier post about Jim's Leonard lines and finding a John Leonard living next door to possibly his brother and nephews. I know that Jim's Thomas Leonard lived in Cheboygan Co. MI & had his Uncle John Leonard living with him in 1900. The death index showed a John Leonard dying in Cheboygan Co. MI in 1901 who would have been the correct age to have been this guy & the one from the 1880 census. I've sent off a lookup request(on July 29) to the library there and am hoping to prove or disprove that. Admittedly none of the top discoveries were made specifically by me. I will admit to prodding other researchers of my lines and asking way too many questions. Whatever works...lol. 2. Millie Hitchcock's maiden name--I believe it was Agnes Jones & another researcher who found the marriage record from March 11, 1806 for George Hitchcock and Millie Riddle in Roane Co. TN records. 3. Comfort Pittman's maiden name-- This is the first of 3 breakthrus that came about from one record. That record was the Application to the Eastern Cherokee of Comfort's Grandson, John R. Dunham--discovered by Royce Dunham & Jan Hicks. John was denied but the application stated Comfort was a Hatfield before she married Daniel Pittman. 4. Finding older Children of Daniel & Comfort Hatfield Pittman--These were listed on Annie Pitman Dunham's son's Eastern Cherokee application. These were children who were out of the household before 1850 census. 5. Comfort Hatfield's parents--The Eastern Cherokee application doesn't plainly list her parents names but it does say her mother was Annie Ross and that her dad was a Hatfield. There is record of an Annie Ross who was the first wife of James Hatfield which we feel is correct considering several key factors. There is also a sworn statement that Annie Pittman Dunham(Dau of Daniel & Comfort Pittman) was at Tahlequah in Aug of 1866 though I don't even pretend to know how to go about finding those records I'm going to try. I need to review the copy of the Eastern Cherokee Application. Thankfully the Wallace College Library where I attend classes has those on Microfilm. 1. My Hale family's whereabouts in the 1860 & 1870 census. More on this in my previous post. 2. My Cook(e) ancestry--My Dad's father's lines have been difficult to say the least and is the line on which I feel I've made the least amount of progress. They were in Bedford Co. TN and were originally from NC. We have the traditional three brother story but nothing proven. My Gr Gr Grandparents William Clifford Cook married Elizabeth Putman in Sept of 1831 in Williamson Co. TN. Elizabeth's parents did live in Williamson Co. I think the best bet on getting an idea of where to search with such a common surname is DNA research. 3. John Fleming--I'd love to know more about John Fleming since there are so many conflicting stories and so many of them to try and sort out. My John Fleming(well actually I have two) was the son of John Fleming and Martha Jane(or Nancy) Edwards. One family story says they didn't immigrate until the early 1800s which I find a bit hard to believe. Another says that John(the youngers) mother was in VA & KY and that his half brother William Marrs Logue married there. They then moved to the Warren Co. TN area which is where I find them in the 1830s. I had initially thought he might be kin to the Williamsburg SC Fleming line but DNA has disproved that so now I'm trying to find his connection. 4. My Pitman/Hatfield line--What happened to Daniel & Comfort Hatfield Pitman family between 1860 & 1870 that caused the entire family to move and be in Rutherford Co. TN before some of them moved on to Gibson Co. TN and then on to OK. There is a native american connection on the Hatfield side but I suspect alot of the cause might have been the upcoming war. I do not know where Daniel was in 1870 as it seems that Comfort was widowed by then. She is not found in the 1880 census so I feel that she too must have passed on. Where are their graves? Are they buried in Rutherford Co. TN? If so it would probably be in the area that was then known as Florence. This area is right next to the Stones River National Battlefield & Cemetery which makes me wonder if Daniel died in the War though I've not found any indication that he served. 1870 Census Rutherford Co. TN Comfort(and family)Elder Daniel perhaps deceased. 5. I've found no proof as to who Thomas Adcock's father was. I have been over the Names of the Adcock men who were in the Warren Co. TN area in 1830 with males in their household who would have been Thomas' age but have not been able to narrow that down as of yet. Perhaps a will or court records exist which would fill in the blanks. I do have Thomas and his widow's pension application but it didn't mention his parents names. Thomas Adcock(1817-1905) lived in the Dekalb Co. TN area the majority of his life. It's Been a Search of a Hale..
My Gr Gr Grandfather Wm. P. Hale & his parents have probably been the biggest brick wall opportunity that I've faced in the 18 years I've been researching. It took me a while to sort through information on Wm. P. Hale and find that he had been married not just once...but three times. I did find him in the census with each of his three wives between the years 1880 & 1920. I've not been as lucky with his parents. How can a family escape being listed in both the 1860 & 1870 Federal Census? The answer is most likely that they didn't & that they are in fact listed but not in a location or with the expected names that would allow me to recognize the family. The family is that of Wm. Taylor Hale and his wife Eliza Adaline Elzey(spelling varies) They had Two Girls(Lucinda Caroline, Mary A.) & Three Boys(James Arvil, Wm P. & John Nathaniel). Here is a time line I've worked out for the family covering the years 1850-1880. They could have left the Van Buren/Warren Co. TN area after Wm. Taylor Hales Death however they were back for Lucinda's marriage & births of both children. I've searched in 1870 for the Bishop surname in the chance that the family might have been enumerated under that name. I've tried creative spellings of Hale. Also have tried creatively spelling Adaline and Lucinda Caroline. Searching age groups within the Hale variants to cut out false positives(hopefully). No signs of them--not sure what to do at this point. I have mixed feelings about the collaboration of FamilySearch & Ancestry.com. Sure it is exciting in some ways...but in others its a let down. Personally, I feel it was a move on Ancestry.com's part to keep from having a competitor who was giving away what Ancestry.com was selling. Granted the census records are only a small portion of what Ancestry subscribers get, they are probably the most valuable in that the census records cover the largest area. Some yrs back I had an Ancestry.com subscription but the most valueable part of that subscription was the census records. This might have been because most of my ancestors were in TN early on and they really don't have alot to offer for that area database wise. I no longer have the need for an Ancestry.com subscription as I have access to HeritageQuest census images. I would hope that this venture will allow FamilySearch to get the indexes online alot faster than they would have had this not been an option. While I've been helping with indexing for FamilySearch I am not sure if I will continue. I will most likely be one of those who will be checking the index at FamilySearch and then locating the Images at HQ. I've been working on Jim's Leonard lines with another Leonard researcher. We both feel there is a connection though we've not been able to narrow it down just yet. Thomas H. Leonard has his Uncle John living with his family in the 1900 Cheboygan Co. MI census. I believe I may have found Thomas Leonard & brothers(if this is him) living with his father in 1880 census. It also appears given the age that this Uncle John & wife were living next door. If this is him then finding the names of John's parents on his death records from 1901 in Cheboygan should give me John & Thomas's Dad's parent's names. Now to write for that. I received Irving Piercie Sutherland's Naturalization papers. While it wasn't overly revealing it did feel in some blanks we had and verified information. Also brought up a transcription of the Allice Shallow Wm Buchanan Marriage. The Searchme.com site helped me to find the death date of Oliver Shallow listed on a WIGenWeb page though he died in MI and had lived in Arkansas. I was also able to find census entries for Oliver's daughter who lived in WI. Very productive day. I had gotten an email from Karren Salminen who is researching a William Buchanan. Karren went on to explain that she had a marriage record which showed that her William Buchanan must have married Allice Shallow before marrying her grandmother but that the age for William Buchanan was off by six yrs or so on the marriage certificate. I wrote explaining that Jim's Gr Gr grandfather Frank Buchanan who married a Julia Shallow had a brother named William and asked if Wm. Buchanan might have had a brother named Frank. I had not really done any research on who Wm Buchanan had married or what children he might have had. Karren replied that her grandfather didn't have any brothers. I received another email from Karren with a copy of the marriage entry which showed that this Wm. Buchanan's parents were John Buchanan & Ellen Lincoln. This meant that this Wm. Buchanan was indeed a brother to Frank as that was also Frank's parents' names. Then just below that it showed the name of Allice's parents. Allice's parents were also Julia Shallow's parents!! So two Buchanan Brothers married two Shallow sisters. I'd not had any luck with the census entries for the 1900 census for Frank's mother(she remarried) or Frank...but with this new info I was able to find census entries for the both of them and also for Wm. 's family. Allice never appeared in a census with her parents because she was born in 1883 and was living with Frank & Julia in 1900. Seems that by 1910 Wm's family had moved along with his Mom & Stepdad to Washington State but by the 1920 census Allice was widowed and again living with her sister and brother in law in Oakland Co. MI. Without having gotten a copy of that marriage I probably wouldn't have been able to find Frank and may have never pursued research on his brother William so I'm doubly in debt to Karren for sending me that info. I don't believe that this Wm. is the one which Karren was looking for but I do intend to try and help find him. I also want to know what happened to William Buchanan and family in Washington. 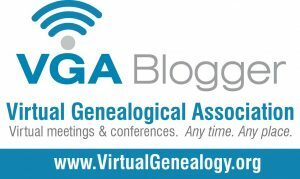 I absolutely love this idea and it shows that genealogist have skills beyond seeking out their own ancestry. 2018. Simple theme. Theme images by Airyelf. Powered by Blogger.